Enjoy terrific mountain scenery as you paddle the beautiful, clean, green water of the Skagit River. We journey eight miles encountering many small rapids along the way. After a hearty riverside lunch and riverside mocha bar, we encounter the famous Shovel Spur rapids, where the Skagit plunges through an S-turn with huge waves and holes. 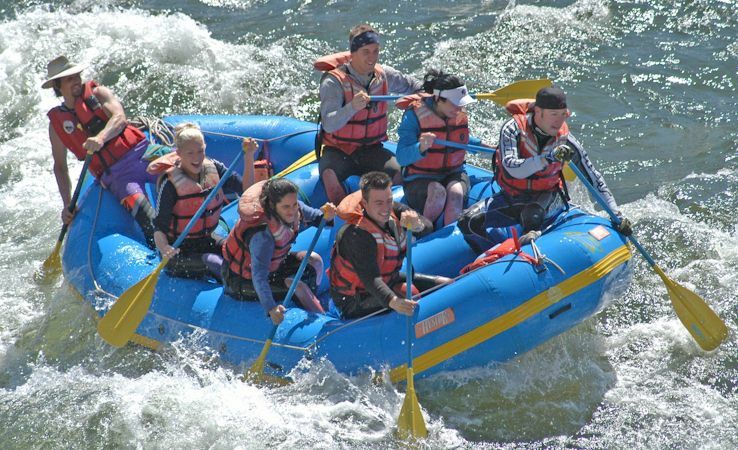 Bring the whole family to enjoy this special river adventure. Meeting Place: We will meet at Goodell Creek Campground in Newhalem, Washington. Newhalem is 60 miles east of Burlington on Washington Highway 20 (the North Cascades Highway). From Seattle, take I-5 north 66 miles to exit 230, Wa 20 (Anacortes, Burlington). Head east, passing through Rockport and Marblemount. Look for the signs for Goodell Creek Campground 15 miles northeast of Marblemount. The drive from Seattle takes 3 hours. Meeting Time: We will meet at ________. Please be dressed and ready to go at this time. Camping: Good camping is available at the meeting place, Goodell Creek Campground and at nearby Newhalem Creek Campground. In Rockport, Steelhead County Park and Rockport State Park offer camping and RV hookups. Season and Water Source: Dam releases give us good flows on the Skagit all year. August is a great time to enjoy the Skagit. Copyright 1997-2017, North Cascades River Expeditions, inc. All rights reserved.